Women’s Web events for women: Here’s our calendar for 2018 as well as a look at past events. Over 3500 women have come to #BreakingBarriers in the last 3 years and made valuable connections that helped them in their careers. If you want to become a freelance writer, whether as a writer for publications or for corporate clients – understand the opportunities that exist today, and how to access them. This workshop is intended for every entrepreneur big or small, using Content to reach out to prospective consumers, or retain existing ones. If you want to use Content more effectively and spend less time creating it, you should be attending. A panel discussion will be held post screening, curated by Women’s Web. The discussion will be centred around women’s emancipation in the Indian context, comprising of panelists who are actively working towards achieving the same. 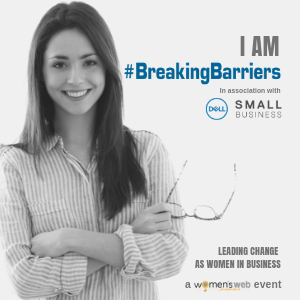 Over 2000 women have come to #BreakingBarriers in the last 3 years and made valuable contacts, been inspired to start or accelerate a business, find opportunities and generate more sales for themselves. Women’s Web is organising Beyond The Doors, an event in Bangalore (on 9th March, Friday, evening) to celebrate women’s presence outdoors – around International Women’s Day. This would include talks and discussions around how women are enjoying and using outdoor spaces. The best photographs from Beyond The Doors would also be exhibited here. If you want to write as a career, whether for publications or for corporate clients – understand the opportunities that exist today, and how to access them. How do you pursue original ideas and ways to maximize your potential while meeting the demands of a fast-paced, dynamic, and performance-driven lifestyle? That is exactly what we will be talking about with neuroscientist-author Vidyangi Patil and successful women in industry, at this upcoming Women’s Web event in Bangalore. The Orange Flower Digital Summit will include talks by India’s leading change-makers, a coming together of multi-talented women, and Awards for Digital Creative Superstars.Join us if you are an avid reader, a blogger, an instagrammer, a Youtube enthusiast, a film-maker, a photographer, a writer, a brand-builder, or anyone who loves the digital medium for the Summit in Mumbai and the awards night. Join us with former Journalist and award-winning screenplay writer, Gajra Kottary, in Bangalore on 20th August. We’ll also meet other inspiring women such as Samantha Unnikrishnan and Nayantara Mallya, who discuss their strengths and vulnerabilities – these are women who have braved the odds to get to where they are today.